﻿A collection of links to Scottish-related websites including News & Events, Organizations, Highland Games, Reference, Mercantile, Music & Dance, Eclectic, Books & Authors and Travel. story! We'd like to thank Brooke and Natalie for visiting our Caledonian site, and for sharing their research. Also featuring: Antique swords and Scottish Militaria. Prices on request. * Piping Duo - (253) 759-4148 Seamus Neary and Suzanne Wolf, 2406 North Stevens, Tacoma, WA 98406. Make your occasion memorable! Nothing is as stirring or as poignant as the Highland Great Pipes. We also play Scottish smallpipes, flute, and whistle, and can provide guitar or fiddle. *The Highland Inn of San Juan Island - Helen King, Innkeeper. P. O. Box 135 Friday Harbour, WA 98250 "Your San Juan Island getaway starts here in Friday Harbor in the beautiful Pacific Northwest. This Island Paradise is full of magical experiences, and what better place to stay than at The Highland Inn bed & breakfast on the exclusive west side of San Juan Island. Think of this quiet, secluded Friday Harbor inn as your retreat with every possible soothing comfort." and winner of the "Great Escape Best Bed and Breakfast Inn"
* Don P. Scobie, Highland bagpiper - Visit Don's delightfully wacky web site, read about his exciting debut solo album, and how you could advertise on his shaved noggin! http://www.bagpiperdon.com Editors note: You haven't heard the theme from Star Wars until you've heard Don play it on the great highland pipes! He's a very imaginative, and inventive piper. * Nae Regrets - Celtic/Fusion/Experimental: "The band formerly known as Circle of Stone". Don Scobie on pipes and Anthony on drums have brought their band out of hiatus and renamed it "Nae Regrets". The same great, innovative sounds with a new name. * A Weekly Offering from KBCS: "Sunday's Hornpipe" - True, this isn't a link to a web site, however, while surfing the web, you can have your radio tuned to KBCS 91.3 FM every Sunday and listen to a great show from 3:00-6:00 called "Sunday's Hornpipe" featuring Scottish, Irish, & related Celtic music. * The Washington Camanachd Club (AKA Shinty) - The great Scottish sport of Camanachd, or Shinty is indeed active in the Seattle area! All skill levels are welcome and they offer coed teams. The WACC formed officially in the fall of 2006 and have regular practices in Seattle and Vancouver Washington, with members coming from as far South as Portland and as far North as Bellingham. Info about where and when practices are can be found on our website as well as how to contact us for more information. We will be making presentations and having a booth set up at many of the local Highland Games, so keep your eyes peeled and be prepared to join in the fun. * Seattle Scottish Highland Games Association (hosts of The Pacific Northwest Scottish Highland Games & Clan Gathering in Enumclaw). "The Seattle Scottish Highland Games Association, a non-profit (c)(4) group, was formed in 1947 by a local group of prominent Scots. The Association provided this group of fellow Scots a means of keeping their ethnic origin alive as well as stimulating an interest in Scottish Highland Games through Scottish dancing, piping, drumming and athletic competition. Listed among the first patrons were Emil Sick, Governor Arthur Langlie, Mayor William Devine and John L. Scott. The first "Seattle Scottish Highland Games" were held in the West Seattle Stadium. Since that time the Highland Games have become a true Pacific Northwest event, thus the name change in 1980 to the "Pacific Northwest Scottish Highland Games & Clan Gathering." Our other sites have included Bothell, Burien, Everett, Fort Lewis, Kirkland, Renton, the Seattle Center and now the Expo Center (formerly the King County Fairgrounds) in Enumclaw. * The McKenzie Highland Games in Springfield, Oregon. An exciting new addition to the Pacific NW! June 9, 10 and 11th at Bob Keefer Activity Center, 250 S. Main Street, Springfield, Oregon. Afternoon Tea, British Car Show, Kidz Zone, food courts, VIP ticketing, live music and 3 beer gardens. * The St. Andrew's Society of San Francisco - Organized in 1863 (unable to find a current website). Highland Hospice - The Hospice is launching a Christmas CD featuring top Scottish musicians singing Gaelic Christmas Carols. The CD will raise funds which will allow us to offer an exceptional standard of free care and support to people with life-limiting illnesses and their families, Highland-wide. All tracks were recorded for two Watchnight Services broadcast on BBC Alba in 2008 and 2009 and this is the first time they have been made available to buy. No artists will receive a fee. * Family-History-Scotland.co.uk - How to trace your family history for free. "Genealogy, geneology, family history, ancestry, whatever you call it and however you spell it, like me, you’re probably trying to learn more about your Scottish family tree." "This site is 100% FREE to all who care to visit and peruse what I have to say. You will notice that I do carry some ads, these help pay the bills, but you are under NO OBLIGATION to click them in order to view the site. At time of writing some 1000 people have dropped by since my last update at the end of August 2005." Tracing Family History in Scotland includes a Getting Started Guide and searchable surname database covering Scottish history to 1600. *The McKirdy Index - an Analytical Genealogical Finding Aid to the Statutory Registers of Death for Scotland 1855-1875. * Scottish Roots - Scotland's foremost genealogical research service. Established in Edinburgh in 1984, we have undertaken over 11,000 investigations for customers from all over the world, including quite a few famous faces! * Echoes of Home - We are a small Scottish company based in Aberdeenshire, Scotland producing personalised videos for expatriate Scots. For parents or grandparents who left Scotland many years ago, their early years captured on video, including homes, schools, childhood haunts, the church where they were married, the places where they worked. We will interview friends and relatives still in Scotland and produce a gift for that very special occasion which will be watched by them over and over and after they are gone be an heirloom to be enjoyed by future generations. Their roots which once lost can never be recaptured. A video we produced for a surprise golden wedding present for a lady in Nova Scotia brought the response from the golden couple: "We would not have appreciated a million dollars half as much. We have watched it over and over and always found something more to enjoy." Pacific NW Life Stories brings life to the family tree through the power of stories. Joan Gordon audio-records interviews with clients while they tell their life stories, and then transcribes the spoken words into a written document. These life stories in combination with the family's genealogical records create a living legacy gift for future generations. * Good News! GaelSong, a celtic giftshop in Seattle, has re-opened in the U District at 1314 NE 56th, Seattle, 98105 (206) 526-8360 Welcome to GaelSong Celtic Gifts & Jewelry! Unique Celtic jewelry and gifts imported from Ireland, Scotland and Wales are waiting to be discovered here. Featured inside are Celtic wedding rings and diamond engagement rings, Claddagh jewelry, tapestries and textiles, clothing and accessories, and leather journals. We also carry many products with Celtic knot designs, the Tree of Life, Celtic crosses, Ogham, fairy motifs, and Pagan and Goddess items. Shop onlinhttp://www.scotlandsgiftshop.come or from our print catalog! * Caledonia Photography by Douglas Ritchie - My name is Douglas Ritchie and I am a semi-professional photographer from Ayrshire on the west coast of Scotland about 12 miles from Robert Burns cottage. *Free E-book on Wearing the Kilt - By Dr. Nick Fiddes, Founder of Scotweb. After years of dealing with thousands of enquiries about every aspect of buying kilts and tartans, I decided that the time had come to try to condense it all down into a simple guide. So with much help from colleagues and even competitors, this is the result. The (free) e-book covers everything from why you should own your own kilt (and you really should!) to how to find your tartan (or other material) to what all the outfits and accessories are. I've written it especially to help people who have never owned a kilt, but are tempted. But I hope there's something there for everyone. The book also provides detailed warnings about how to avoid being ripped off by the frausters who plague the highland dress market today (both on the high street and online) selling poor quality copies from cheap labour economies, that drive authentic producers out of business. I feel strongly that people should understand the threat these people pose to honest shops and traditional skills, not to mention to the dignity and even safety of people who innocently buy their rubbish. * Scots Connection - Since 1999, from our base in the heart of castle country, we have supplied quality Scottish tartans, traditional Scottish gifts, and the finest highland dress, to thousands of satisfied customers around the world. We offer an extensive range of Scottish tartan gifts, highland dress, tartan material in thousands of tartans, and Clan crests for most Scottish Clans and families. * Highland Hoots - Humerous original cartoons, prints, greeting cards, and postcards. Highland Hoots are inspired by the loveable creatures depicted therein. Few animals have more personality than a highland cow and Scottish American artist Lois Bee has set about capturing their expressions, putting them in human situations and hopefully putting smiles on people’s faces. * Celtic Virtue - Welcome to Celtic Virtue Ltd. We are an Irish company based in Dublin where we make Celtic engraved memorial plaques and award plaques inspired by our ancient monuments, Celtic and Christian symbolism. All the memorial and award plaques draw from our rich history and tradition of craftsmanship. These small plaques can be ordered online using our secure payment service; your personalized plaque will then be shipped to your nominated address either for yourself or as a gift to someone else. If you would like to commemorate a loved one with a Celtic engraved stone, to honour Celtic heritage and roots, feel free to browse our website to find the ideal memorial plaque. If you would like to reward someone or send wishes for a happy occasion, that will stay carved in stone forever, we are happy to provide you with a Celtic engraved award plaque. It is said in Gaelic proverbs that "to know where you're going you have to know where you've come from". Never has it been more interesting to know about your ancestral history and more important to commemorate your lineage. Our engraved stones are crafted from Irish Blue stone, Celtic Green Stone and Gaelic Black stone. For centuries these stones, known for their healing powers, have been engraved by the Celts to commemorate big occasions and loved ones. *Streaming Pictures - a small company which has been in business for just a year, producing CDs and DVDs of Scottish Traditional Music and Dance. We used to live in England near London, but 3 years ago decided to move to Scotland to be nearer the music and dance which we love, and now live near Lockerbie. Iain Hale has spent over 30 years working in Television for the BBC and other media companies in London, and overseas in California and Italy, I am well known for devising the dance Fisherman’s Reel, contributing to the Dance On! Magazine and I teach several Scottish Country Dance classes in my local area. We have produced two volumes of a DVD series called Meet the Musician in which well known Scottish Traditional musicians talk about their influences, how they got started, some amusing anecdotes and play some music together. We have also produced a CD by Kenny Thomson and the Wardlaw Scottish Dance Band called We Twa, and a DVD which shows the dances twice through (no excuses for not knowing how to do them!). Our latest release is ‘Learn to Dance Ceilidh’, a DVD which gives instructions for the ten most popular Ceilidh dances, the steps, a walk through and then the dances demonstrated at full speed! There is also a CD of the ten dances played by the Stuart Anderson Scottish Dance Band. I hope you will be interested in our products; please have a look at our website to see what we have produced in the last year. * Scottish and Irish Music at Mick Kelly's Irish Pub and Restaurant (Burien) - My name is Wayne Norris, I am the past Chairman of the U.S. National Scottish Fiddle Championships and was responsible for moving the event from Loon Mountain, NH to Mount Vernon WA in 2001. We, my wife Sue and I, have been asked to host bi-weekly Scottish and Irish Music sessions at Mick Kelly's Irish Pub and Restaurant in Burien. We will be starting the sessions on Sunday, November 4Th at 4:00PM until 7:00PM and will continue every second Sunday thereafter. Webmaster's note: I found "The Curewife" fascinating, and the ending ingenius. * THE GUYND: A Scottish Journal by Belinda Rathbone - An enchanting memoir of rural life in Scotland, THE GUYND: A Scottish Journal (Quantuck Lane Press, distributed by WW Norton, Publication Date: Oct. 25, 2005; $23.95 cloth) chronicles author Belinda Rathbone's years as the unlikely American mistress of a sprawling estate outside Edinburgh. As a transplanted bride, Rathbone turns the observant eye of a foreigner to rural life, and provincial Scotland blooms in beautiful detail as she settles into her new husband's ancestral home and grows to understand the deep claim it holds upon him. The Guynd - as the crumbling Georgian country home is called-has housed five generations of Ouchterlonys, and the weight of its 400-year history shapes the daily lives of its inhabitants. As Rathbone negotiates her place in her new home, she encounters Scottish rituals both baffling and delightful, and a feudal system that still thrives among local aristocracy and their tenants. The holidays come complete with new traditions including the annual county ball, the fall pheasant shoot, and the ancient Hogmanay rituals of New Year's Eve, but for Rathbone, the mansion itself is the greatest joy. The Guynd still bears the scars of two World Wars, and its grounds are overgrown with derelict gardens and collapsing cottages, but Rathbone's improvements fly in the face of this decay, despite her husband's frugal nature and resistance to change. As seasons pass, the Guynd blossoms under their care, and subtle shifts in their marriage bring poignancy to Rathbone's memories of their years in the mansion. Steeped in a deep appreciation of Scottish culture, THE GUYND explores the living history of Scotland. A lovely meditation on family life, Rathbone's memoir reflects the weight of the past up on the present, and above all, the ties that bind us together. Belinda Rathbone is a historian who has written widely on modern and contemporary photographers. The author of 1995 New York Times Notable Book Walker Evans: A Biography and contributor to magazines such as House and Garden and Architectural Digest, Ms. Rathbone lives in Cambridge, Massachusetts. *Leadership Book by Scottish Born George D. Wells, The American Dream in a Kilt, CEO Shares Secrets of Leadership, Life & Laughter - A new book publishing September 15, 2006. Meet former Silicon Valley CEO George D. Wells, authentic leader who shares how his Scotland roots shaped his corporate cultural values, his top 11 communication secrets that created profitable and healthy working environments and how empowering employees leads to success.San Jose, CA (PRWEB) August 29, 2006 -- Meet Scottish-born George D. Wells, author of The American Dream in a Kilt, CEO Shares Secrets on Leadership, Life & Laughter publishing on Amazon September 15, 2006. This book is more than a typical management book. Take a peek behind the corporate curtain and see how things really happen in the executive suite. From decisions on international business, firing hundreds of employees to meeting The Queen of England. How do you help build Silicon Valley into a $242 billion semiconductor business? By leading corporations to profitability, beating unions and empowering people around him. Learn George's 11 communication secrets to success, how to hire a witch doctor and when to wear a kilt to the office. George D. Wells arrived in the United States from Clydebank, Scotland with $200, a wife, a baby and a job offer in Boston. After spending several decades building Silicon Valley he resides in Saratoga, California and continues to give his expertise as Lead Director to QLogic Corporation and board member of The First Tee organization. George, a dynamic leader, has conducted business all over the world, has given hundreds of speeches and is mentor to many. Visit our website for biographies, stories, book receptions and testimonials. * Argyll 1730 - 1850 recently shortlisted for the prestigious Saltire Society Scottish History Book of the Year Award. Argyll 1730-1850 is a systematic account of what happened in Argyll in the period, starting in the 1730s, when the county’s old social and agricultural order was overturned by its landowners. In this thoroughly researched, comprehensive and instantly accessible book, Robert McGeachy tells the story of a revolution – one that would extend to the rest of the Highlands and Islands – set in train when Argyll’s leading families, Campbells always prominent among them, turned their backs on clanship and embraced an explicitly capitalist approach to the management of their estates. Robert McGeachy’s sympathies lie with the victims of this revolution – men and women whose communities fell apart as the pace of landlord-induced change accelerated. But for all that those people suffered because of what was done to them, they did not suffer passively. If Argyll’s lairds were at the forefront of modernising – as they saw it – Highlands and Islands society, the generality of Argyll’s population were in the vanguard of organising resistance to the new order. Their fightback, as Robert McGeachy shows conclusively, was both more widespread and more effective than generally tends to be thought. Argyll 1730-1850 also examines what is to be learned of social upheaval from folk belief; quarrying, mining and the beginnings of industrialisation; Argyll men’s increasing participation in the British military; official hostility to Gaelic; and just about everything, in fact, that helped to make Argyll, by the mid-nineteenth century, so radically different from the Argyll of a hundred years before. "When Elliot Walker overhears his boss, the chairman of one of the world’s largest energy companies, ordering the Leader of the Opposition to come up with a strategy to fix the ‘Scottish Problem’, he reckons his old friend Dixie Armstrong is the very person who should know about it. Unfortunately for Elliot he has no idea that his eavesdropping is about to uncover a series of events which could bring the British political establishment to its knees. Poor Elliot, if only he had kept his mouth shut! Especially when those involved include a Washington-based private equity firm, high-powered leaders of industry, the Security Services and an ancient Masonic brotherhood! 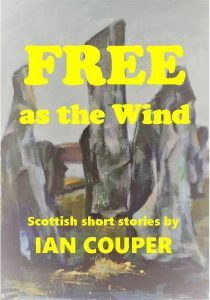 A rollicking, energetic and absorbing tale of cultural manipulation and political conspiracy, A Yearning for Jacob’s Son is one of the most controversial books of our times"
* Free as the Wind, an e-book of Scottish Short Stories by Ian Couper, is now available on Kindle and Kobo. A synopsis and other info can be found on the website: www.ic-booksandmusic.co.uk The site also has samples of the author's music and all the pages are self-explanatory. Scotland is one of the world's most popular venues for destination weddings. Who wouldn't want to marry in a country which combines romance, beautiful scenery and splendid historic surroundings? This book goes through the whole process in depth and include details of over 100 of the most stunning and unusual wedding venues in the country, including fairytale castles and imposing stately homes, romantic ruins and ancient abbeys. The book is illustrated throughout with the personal experiences of couples who had their own dream weddings in Scotland. For the many couples who wish to marry in Scotland, the hardest thing is making the arrangements from a distance. This book does the research for you, leaving you with the fun part of arranging your dream wedding! "Did you know that the Declaration of Independence was based on a Scottish declaration against the English from nearly 700 years ago? This book will take you from the days of William Braveheart Wallace and Robert the Bruce during the Wars of Independence in Scotland, to the days when Scottish and Irish people immigrated to the American Colonies and helped George Washington and Thomas Jefferson fight for freedom in America during the Revolutionary War. Follow the thread from Scotland to America and come to understand how important one ended up being to the other in the development of democracy." "Linda MacDonald-Lewis has been involved in promoting Scottish History in America for 20 years, and has sold Scottish books from her thriving shop on the American West Coast for over a decade. She works as a Master Performer at Highland Games all over the country, telling stories, reciting poems and singing. She also presents seminars on Scotland's history, mythology and folklore." Monument to the Arran Clearances. Photo from the cover of 76. ‘The Stuart Agenda’, a first novel by Caithness author Alan Calder, has just been published as an e-book by the Willow Moon Publishing Company of New Orleans. ‘The Stuart Agenda’ is an intriguing take on history. It describes a conspiracy to get a young scion of the long defunct Stuart royal dynasty on to the throne of newly independent Scotland. Set in the 2030’s, fact and fiction merge as Robert, the charismatic Stuart heir strives to regain his heritage. He finds love and the key to his quest in the heady political atmosphere of Scotland at last going independent. It is a political thriller with adventure and romance thrown in. In fact the perfect holiday read. You can read excerpts from The Stuart Agenda and download from www.willowmoonpublishing.com as a PDF to computer or i-Pad and other e-readers. You can free read the first few chapters on amazon.co.uk and download to a Kindle. The Referendum intertwines with the American experience. Three words rouse the hearts of Scots and undoubtedly had some bearing on the Referendum. They were also an important factor in the American colonial struggle against London. The three words, ‘but for freedom’, are in the English translation of the Declaration of Arbroath. It was a petition signed by Robert the Bruce and his Lords in 1320 after defeating the English at Bannockburn in 1314. Directed to the Pope, it requests he intercede with the English to leave Scotland alone. Translated from Latin an excerpt reads … ‘it is in truth not for glory, nor riches, nor honors that we fight, but for freedom – for that alone, which no honest man gives up but with life itself’. The tone was a national cry for the right to freedom and the right to defend freedom. It was a consequence after centuries of English kings scheming to conquer and subdue their neighbor to the north. The egalitarian values of the Enlightenment kindled the concept of natural rights in those three words centuries later. The religious reformation to Presbyterianism stressed the need for every Scot to have the ability to read the bible. This brought universal education, the highest literacy in Europe, and a well-educated middle class. However, after the union of the Scottish and English parliaments many of the moneyed elite were ensconced in the fashionable life of London. Their absence denied patronage to academicians. Consequently, diminutive Scotland, the poorest yet most literate country in Europe, had great influence in the American colonies with the influx of academicians from its shores. They became tutors, teachers, and professors. Instilled with the concepts of the Enlightenment, they had enormous influence on the young minds of future colonial leaders. One such educator was the young William Small, Professor of Philosophy at William and Mary. He was an ardent disciple of the Enlightenment. Thomas Jefferson was one of his students to become captivated with his egalitarian beliefs. His Declaration of Independence was a rousing affirmation of natural rights to self-determination and freedom. Elizabeth Rodger, a graduate of Glasgow School of Art, now resides in New Jersey. She has taken those three words as the title for her novel BUT FOR FREEDOM – Across the Sea beyond Sky, and the sequel BUT FOR FREEDOM – A Rebellious Echo of the White Cockade. The theme is historical fiction based on the history of Scotland and Virginia. The story begins with a dark period in the rancorous relationship between Scotland and London. The sequel dwells on the rebellion of the American colonies to the edicts from Parliament. In 1707, the Scottish nobility ceded with economic enticements to a Union of the Parliaments. There was rioting in Glasgow and Edinburgh. Decades later, the effort of Bonnie Prince Charlie to reclaim the throne was lost. A superior English force routed the Highland army at Culloden. Orders from London to ‘give no quarter’ had the English force scouring the Highlands. The ensuing destruction decimated clan culture. With no economic future, many Highlanders herded on disease-ridden boats, indenturing themselves for years as payment for passage. The storyline follows the MacKenzie family after the torching of their home and their forced emigration to the ‘New World’. With assimilation in the Virginian culture, they prosper. The oldest son commissioned to serve, survives the horrors of the French and Indian war. The youngest son befriends Thomas Jefferson at William and Mary. He returns to Scotland to study medicine in the hub of the Enlightenment, Edinburgh. He travels north to his birthplace to find the once thriving glen quite empty. Correspondence from his brother reports the rising anger in the colonies to the edicts from London. The beginning of armed conflict begins when the colonialists cross the North Bridge at Lexington in Massachusetts to confront the British force. They marched to the piping of The White Cockade, a melody associated with the white rose Bonnie Prince Charlie wore on his bonnet. It was a taunting sign of defiance to the English army. As the colonies unite to confront the British forces, the story ends with the reading of the Declaration of Independence on the courthouse steps in Williamsburg, Virginia. BUT FOR FREEDOM-Across the Sea beyond Sky and the sequel, A Rebellious Echo of the White Cockade are eBooks available on www.lillibettbooks.com/BigKids or directly from Amazon Kindle. I am very pleased to announce the publication of my first novel, “The Year of The Prince”. The book is volume one in a sequence of five novels of alternative history (“The House of Stuart Sequence”) which, between them, will present how our history might have changed if the Jacobite Uprising of 1745 had been successful. The sequence traces a line of monarchs from a restored House of Stuart through to the year 1900 and shows how British, European, American and World history could have been different if “Bonnie Prince Charlie” and his supporters had carried on to London and not retreated from Derby in December of 1745. The book is published by Sea Lion Press, the UK’s leading publisher of alternative history. The Sea Lion Press website (www.sealionpress.co.uk) gives details of more than 40 of their alternative history novels which are currently available. You can also sign up to their mailing list from the website. I hope you find the book of interest. Note: See "The Celtic Treasure Chest" in Vancouver, listed above under "Mercantile" for details on their tour to Scotland. * Scotland Golf Tours - We arrange golf tours to Scotland & Ireland for golfers from all over the world. We also arrange tours to the famous courses in England and Wales. All of our packages are custom made to ensure that you get the most that you can from your golf tour. With over 2000 courses to choose from we can offer classic links golf, scenic parkland golf, challenging championhip courses and also many excellent local courses that will thrill and challenge every golfer. We include guaranteed tee times on all the famous courses on the Open Championship rota and the British and Irish Ryder Cup Courses, and frequently include tickets to some of the major professional tournaments in Britain and Ireland each year. Contact us now to discuss your tour and obtain your free quote and itinerary. *Secret ScotlandTours - self drive tour itineraries, selected accommodation guides and online information on over 150 major attractions. “We are passionate about showing you the best of Scotland. We’ve travelled the country extensively to create this website. We’ll guide you to the best experiences, but equally we’ll warn you about the tourist traps that aren’t worth visiting, because we’ve seen them, done them, and when necessary, tasted them. Few guides are more comprehensive or honest. We have compiled a wide range of self-drive tours for every taste and interest, of different durations, and covering the whole of Scotland. They give you the benefit of honest and unbiased first hand experience. They will guide you to find the special secret places that most tourists will never find. Our aim is to offer you a great choice of opportunities to experience Scotland as the Scots love it. Let us plan your customised self drive tour of Scotland, including accommodation reservations and car hire. One of our sample itineraries is the Classic Tour which is ideal for first-time visitors to Scotland. Another is the Diana Gabaldon Tour, for fans of that novelist. Read our introduction to Scottish Castles, Inns & Country Houses to see some of the variety of accommodation you can experience. * Executive Golf Tours Scotland Ltd, andExecutive Golf Andalucia - By way of introduction, we are the new travel partners for Executive Golf Tours Scotland Ltd.
Executive Golf Tours Scotland Ltd was established 25 years ago by its President, Howard Morris. EGT (Scotland) specialise in luxury corporate golf tours including St. Andrews (where we have 100% booking record to date) Kingsbarns, Gleneagles, Carnoustie and just about every other well-known Scottish course you can think of. Tours also accommodate non-golfers on shopping and sightseeing tours, whisky tasting and much much more. Your members, will I know, appreciate that the international links with Scotland, both historic and contemporary, run deep and remain strong. GOLF IN SCOTLAND: Scotland, the home of Golf, has over 540 golf courses to choose from, as well as world famous championship golf courses, new Scottish golf courses such as Kingsbarns, St Andrews Bay Torrance and Devlin courses and The Roxburghe in the Scottish Borders are firmly part of the 'must play' circuit. And many more classic links, parkland and heathland golf courses welcome visiting golfers every day of the year. Executive Golf Andalucia replicates the service from the Costa Del Sol with the only notable difference being the Costa Del Sol is named as such for a reason, in that the sun actually shines on average 320 days a year! As per our Scottish office, non-golfers are very well catered for too. We can organise days spent relaxing on one of the Costa Del Sol's beautiful beaches, swimming in the Med, sampling Spanish cuisine from the beach restaurants, shopping in the sophisticated retail centres or at one of the colourful local street markets, cultural tours, or we are also happy to arrange spa visits, horse riding, tennis etc. We look forward to welcoming you to both Scotland and Spain and sharing with you many of their cultural and sporting delights.